Josiah Harmar was born in Philadelphia, Pennsylvania, on 10 November 1753. When he was 18, he was appointed a captain in the 1st Pennsylvania Battalion. In October 1776, he entered the Continental Army as a captain in the 3d Pennsylvania Regiment. He became a lieutenant colonel in 1777 and a brevet colonel from September to November 1783. Harmar married Sarah Jenkins in 1784. In 1784, he was appointed as lieutenant colonel commandant of the First American Regiment; he served as the senior officer in the United States Army from 12 August 1784 to 4 March 1791. He was brevetted brigadier general 1787. In 1790, the Miami Indian villages defeated his punitive campaign along the Maumee River. In 1791, he was exonerated for the expedition’s failure. 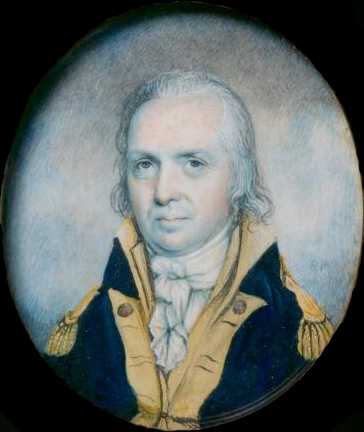 Retiring from active service in 1792, Harmar returned to Pennsylvania, where he served as adjutant general from 1793 to 1799. He died in Philadelphia on 20 August 1813.